To be sure, 2014 is shaping up to be a dismal breeding season. Ice-out occurred weeks later than usual, owing to thick ice and cool weather in March and April, and delayed breeding for all loon pairs. The ensuing warmup in May caused the black fly population to explode to higher levels that we had ever seen. Pairs that had just laid eggs were blanketed by the relentless bloodsuckers and incubating males and females driven off their nests at rates never seen before. In short, almost all loons abandoned their first nests. 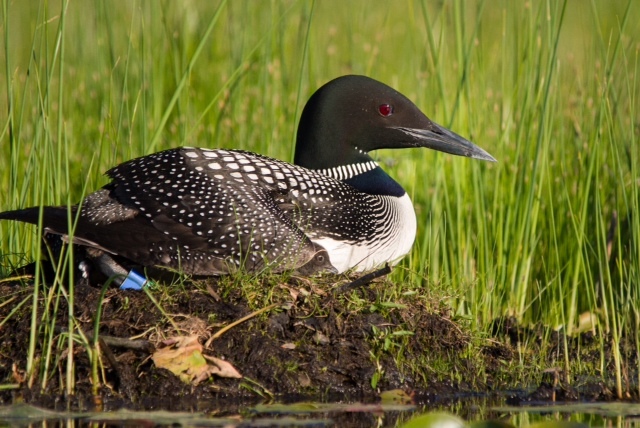 Although it is counterintuitive, loons are probably more vulnerable to nest abandonment than many other birds because males and females incubate the eggs equally. Consider the plight of loons trying to incubate their eggs to hatching for 27 days in the presence of black flies. Each pair member must incubate for stretches of several hours before being relieved by its mate. The rotation system must be efficient enough that eggs are incubated over 99% of the time. When not sitting on eggs, a breeder rests, preens and forages to replenish its energy reserves. If either pair member fails to incubate, the nest is doomed to failure, because its mate cannot compensate for missing incubation by remaining on the eggs at all times without long breaks for foraging. So we have a case where the weakest link breaks the chain. Even a tough, determined male incubator is destined to lose a clutch if his mate is less determined than he is and refuses to sit on the eggs and tolerate the torment of biting insects. We have learned about the necessity of dual incubation from past observations. Nest abandonment commonly occurs following territorial eviction of a pair member during incubation. If its mate is evicted by an intruder, the remaining pair member usually continues to sit on the eggs for a time. With rare exceptions, though, its new mate (the usurper) does not incubate — why should it sit on eggs containing young to which it is unrelated? — the cycle of shared incubation duties breaks down, and the nest fails within a day. (If it is early enough in the season, such pairs will lay a new set of eggs that both will incubate.) A rarer cause of nest failure during incubation is death of a pair member. In 2005, the female on Alva Lake was killed by an eagle while sitting on the eggs. The male valiantly sat on the eggs, taking breaks to forage from time to time, even as female floaters competed in front of him to fill the breeding vacancy. Despite being within a week of hatching, this male could not complete incubation on his own, and the nest was lost. Enough talk of failure! I will end on an up note by showing you the sweet photo that Linda Grenzer took of a breeding male sitting on a nest. This bird and his mate both tolerated the record outbreak of blackflies earlier in the season and were rewarded with a little fuzz-ball — a much-needed reminder that all is not lost this year. Let’s cross our fingers that other pairs, many of which are incubating a new clutch of eggs after abandoning the first, will be able to duplicate this effort. On Manson Lake, the long-time male breeder was displaced in May of this year by a younger male. After seizing control of the territory, the usurper proceeded to nest with the long-time resident female. But the original territory owner did not give up on his territory easily. He remained in the vicinity and was a frequent intruder into his old domain. In fact, between the 13th and 19th of June, the old male drove off the usurper and regained ownership of his territory. At this point, incubation by the female and the usurper was well underway, and the eggs were within 10 days of hatching. The female continued to incubate the eggs, and the old male — though he had played no part in the reproductive effort and had not fertilized the eggs — defended the nest. (We did not observe him to incubate the eggs, however.) When the eggs hatched, he treated the chicks as his own. Territorial usurpation creates some awkward reproductive decisions for loons. It is common for a breeder to lose ownership of the territory during a breeding attempt. In most cases, incubation ceases, and eggs are abandoned. If there are chicks present, they are often killed by the usurper, while the remaining pair member looks on helplessly. Manson is not the only lake where a usurper has seized control of a territory but continued to care for offspring that do not belong to him. In fact, we have observed at least 5 other cases of such behavior — all among males. That is, we now have 6 cases where a usurping male has wrested territorial ownership away from the male breeder but either permitted the young to survive and be reared by the female breeder (2 cases) or seamlessly stepped in to assume paternal responsibilities (4 cases). I am beginning to see a pattern! Evolutionarily speaking, animals should behave so as to maximize the number of their own young they contribute to the next generation. It is generally unexpected to see animals care for young that are not their biological offspring. I will continue to be on the lookout for more examples of such behavior in loons — and will puzzle over the apparent tendency of male usurpers, but not females, to be willing to adopt the offspring of their predecessors. It is still early, but I can already see that 2013 will be a good year for chick production in northern Wisconsin. Thirty-nine of about 120 pairs that we follow have hatched chicks already, and 24 other pairs still have active nests and might produce chicks. Since it is always a dicey proposition to incubate eggs for four weeks without a raccoon eating them or some other calamity befalling them, having almost half of all pairs rear chicks successfully is cause for celebration. We are feeling good about the population. In the past five days, the list of lakes with a chick or chicks has grown to five. The list is growing, but still small. We cover over 100 lakes in Oneida, Lincoln and Vilas Counties, so this constitutes less than 5% of our study lakes. It is still early! Don’t panic if your breeding pair has not even nested yet or has failed in a first attempt. There is still time for them to bring off a brood. First Chick of the Season! We are happy to report the first hatch of the season. This one occurred on Jersey City Flowage, our southwestern-most lake, and was found by Jacki, my student from Chapman. JCF had the earliest hatch in the study area last year, as well, so they are staying true to form. We are hoping for many more chicks soon, but don’t hold your breath; this pair seems to be at least a week ahead of other early nesters. Great news! Our manuscript that describes natal site matching was just accepted for publication in a prestigious ecological journal. Very exciting to get the story out there that young loons have a strong statistical tendency to settle on breeding lakes that match their natal lake in both size and pH. 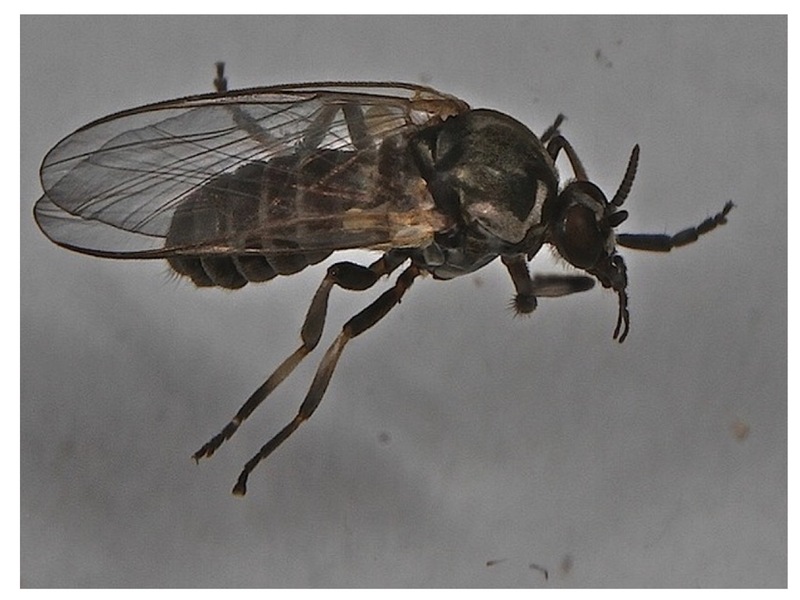 Many of the pairs I have observed on recent days have spent their time on the surface in a fruitless effort to shake or toss their heads to rid themselves of blackflies. Loons have their own dedicated species of blackfly, Simulium annulus, that depends on them for a blood meal prior to reproduction. Blackfly populations vary from year to year, and it seems pretty clear (though not scientifically proven) that the numbers of these nasty blood-suckers and their synchrony with nesting determines how many loon pairs abandon their nests in May. 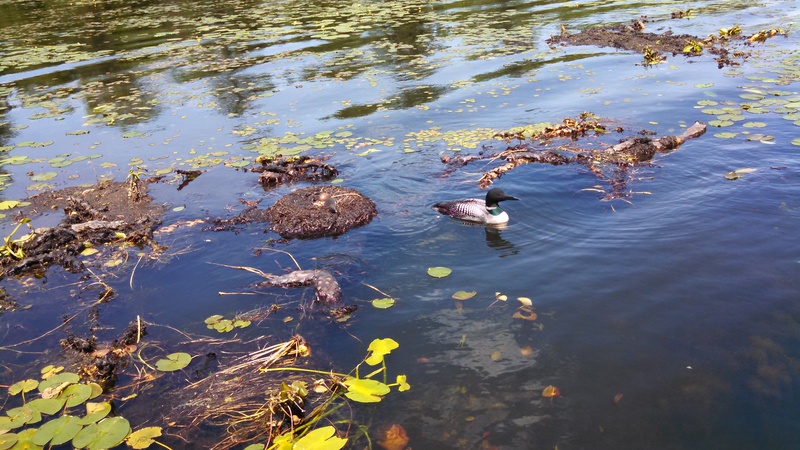 At this point, we have found seven loon pairs that have just initiated nests. I hope that this first wave of nests survives the blackfly infestation. In 1996, also an extraordinarily late year, abandonments occurred at a moderate rate (about 20%), but were not devastating, as in some years. So, I am optimistic that it could still be a good year for chicks, despite the lateness of ice-out.